Southern Africa has always attracted adventurous and romantic souls – discerning travellers who crossed the land in as much comfort as possible. But it was not until 1923, when the first deluxe train was introduced between Johannesburg and Cape Town, that truly luxurious train travel became a reality. The train, with its distinctive sapphire-blue carriages, was known as the ‘Union Limited’. However, people soon began referring to them as 'that Blue train' and so... a legend was born. Enter a timeless world of grace and romance, where uncompromising luxury is the theme. By day, your private, elegantly-furnished Suite, finished in birch veneer panelling, has generous lounge chairs and a writing desk. In the De Luxe suites, Italian- marbled, en-suite bathrooms have either a three- quarter size bath or shower. Luxury Suites are one square metre larger and have full-size baths with hand-held showers. CD players, video players and Wifi are available throughout. 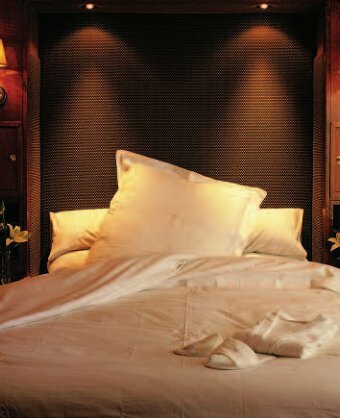 By night, your suite is magically transformed into single or double beds made up with fine linen and exquisite duvets. The Blue Train is a magnificent showcase for the finest gourmet menus and award-winning South African wines. The extensive wine list has been specially selected to complement the fine menus. Breakfast, lunch and dinner are served in two sittings in the elegant wood panelled dining room and a lavish high tea is served in the luxurious Lounge Car . Enjoy drinks before dinner with fellow passengers in one of the lounges, or the spectacular Observation Car at the rear of the train. The large windows throughout afford wonderful panoramic views of the African countryside. In keeping with the ambience of the train, lunch is an elegant casual affair while dinner is more formal with jacket & tie mandatory for gentlemen. 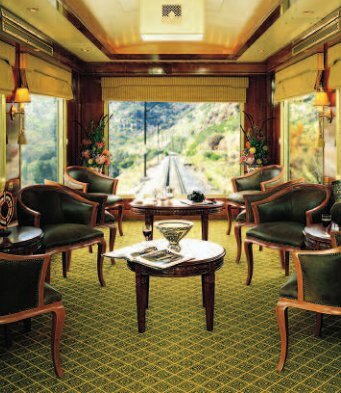 The Club Car Lounge, situated at the front of the train, is the only section of the train designated for smokers and will definitely find favour with those seeking a peaceful place for after-dinner cognacs, coffees or cigars, a game of chess or backgammon. Each coach also has a professionally-trained butler available 24 hours a day to anticipate and accommodate your every need. The train offers a jewellery boutique shop selling beautiful local gems and Blue Train branded mementos. Excursions off-train depend on the direction of travel. Tour Kimberley Diamond Museum and Big Hole on the Pretoria to Cape Town route. Alternatively stop at the historic Victorian village of Matjiesfontein on the Cape Town to Pretoria route. Guests travelling on The Blue Train can enjoy one complimentary night's accommodation at a 5* hotel, before or after their journey, including bed, breakfast and the transfer between the hotel and the station. A 27-hour, 1600km journey through some of the most diverse and spectacular scenery. Please call us for latest departure dates. As above but in reverse. Please call us for latest departure dates.